It seems like midwinter was just yesterday, but already it's less than two months to sunrise. Two months of continuous night must sound like forever to people used to daily sunlight; to a mind wintering down here, it's barely a moment. The first light of dawn will be visible sometime late August (people have reported seeing it on clear days in early August in previous years), so we've really got less than a month before the sun begins intruding on the night sky. Take off the two weeks of moonlight we get every month, and we're really down to only two more weeks of full darkness. Again, a two weeks of fully dark night outside must sound unending and dismal to people in the real world, but down here it's the blink of an eye. And it's beautiful. Mentally, I'm not quite done with the night, and already feeling a bit apprehensive about losing it. I'm not generally a huge fan of the dark, and certainly do miss sunlight, but I doubt I'll ever get another chance to live in a perpetual night - best experience it while I can. 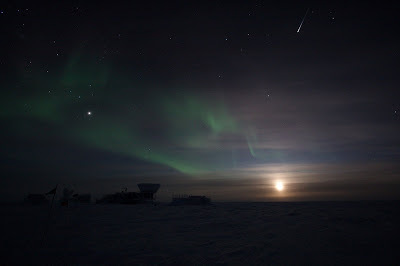 The moon sets tomorrow, so our last chance for truly vivid auroral displays is rapidly approaching. I'm going to have to alter my schedule to make sure I'm outside as much as possible over the next couple of weeks - get it all out of my system.